Paint correction removes or reduces existing marks in car paint to improve the look of the finish and in most cases, this improvement is quite dramatic. This page provides specific information about the services that we provide to deal with marks in your car's paint, but if you'd like to know a little more about paint correction itself, then please visit our What is Paint Correction? page. Most detailers talk about 1 stage, 2 stage, 3 stage correction, etc. but what does this really mean? Sadly, there is no industry standard for what to expect and we often find that there are large variations in the quality of results actually achieved. We like to be open and keep things easy to understand so offer 4 named services with clear, upfront descriptions of what each will provide. Those services are listed below in order of the level of correction that they deliver. Please note that the pricing below is for correction only. An additional detailing service such as our Studio Detail would need to be added to allow for the appropriate preparation and finishing required. The Refine Correction is literally aimed at refining the paint finish on your car and it can make a dramatic difference to the way it looks. Typically we will use a combination of light polishes and/or heavy cleansers which are machine polished into the exterior paintwork with every panel being treated 2 or 3 times as required. Our carefully chosen products and very specific techniques can get amazing results while reducing paint depth by the smallest possible amount. Remove any existing buffer trails/holograms Remove deep etching from bird muck, water, etc. Make the paint feel beautifully smooth Remove/reduce "orange peeling"
This multi-stage process combines light polishes, heavy cleansers and three coats of the amazing Glare sealant (two of which will be applied by machine polisher) to provide a stunning combination of paint correction, 12 months plus of protection and a superb glossy finish. We think that the look of Glare is easily a match for any traditional wax and in fact, pretty much all of our customers prefer it. However, if you'd like us to top the work off with one of our concours carnauba wax finishing products, then we'll happily do that for free! Glare takes a little time to apply correctly and get the best results, but it really is an astonishing sealant - simply the best combination of protection and look that we have ever come across! Please note that this service is currently unavailable - see our home page for more information. The Revive paint correction service is aimed at removing marks which go beyond what Refine or Reflect can deal with. These deeper marks might include light scratches, light to medium etching (which may have been brought about by bird muck, fly squash, hard water, etc.) and circular scratching (deeper swirl marks). Typically we will use a combination of diminishing abrasive polishes and high-tech pads which, while able to provide a great level of improvement to the paint, are still gentle on the finish. Every panel is treated once or twice before the Refine process is used to ensure that the results look stunning. Make a minor reduction to "orange peeling" Remove "orange peeling"
The Restore Correction is designed to remove/reduce as many marks as possible while always staying within the safe, long-term limits of the existing paint. The service is so comprehensive that, for some cars, it can take even two highly trained detailers several days to complete. Typically, we will undertake multiple rounds of controlled compounding and follow this with both the Revive and Refine processes. We'll take even more extensive paint depth readings at the start and as we work, while using techniques which ensure the paint is levelled as sympathetically as possible. This process can be used on any car but is ideally suited to concours, restoration projects or for customers who demand the absolute best from the paint finish on their cars. Put simply, this level of service provides the most extensive, safe correction available! Reduce the appearance of "orange peeling" Completely remove most "orange peeling"
* The actual results will vary depending on the car paintwork type and current condition. 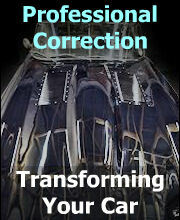 All correction work will be thoroughly discussed with you before we start work and a fixed price quote provided. We don't charge for quotations or discussing your car's condition, so please feel free to drop us a line.